Scotch is quintessentially manish. That’s certainly not to say that women don’t like it (Elisabeth being a prime example), but you must admit, it’s typically considered a man’s drink. And, with Father’s Day just around the corner, now seems like a most appropriate time to talk scotch. And, I’m talking serious scotch. When you walk into my house, you can’t help but notice the liquor collection. It’s giant, occupies a full wall, possibly visible from space and can be more than a bit itimidating. The less discerning stop there. But, I’m betting you’re not one of those. You’d notice that the bottles are catagorized and and the top shelf is comprised of personally prized bottles. Looking closer, you’d note that almost all of those are scotch. Not to say that I don’t treasure all sorts of liquors, but I do love me some scotch. At recent count I have nearly 30 bottles of scotch. Mostly single malts, a few select blends and all at a variety of ages and finishes. A lot of scotch to be sure. And, the bottle of Laphroaig Cask Strength tucked along one side was one of my very first. After that tasting I knew I needed a bottle of smokey, peaty Laphoaig to sit atop my shelves. At first, I bought it almost as a challenge and it’s been consumed in much that same fashion. It was bold and strong and deep. Lots of peat, lots of smoke. A challenge to be sure. But as the years have progressed my palate (and my view on whiskies) has changed. It’s not a challenge any more, it’s just a fantastic whisky. One to be valued precisely because it is so bold, it is so different. As such, when the opportunity presented itself to sample some of the other expressions, I jumped on it. Laphroaig has a hugely distinct flavor profile and there are a few key factors that play into making the whisky what it is. First, and some would say most important, is the water supply. 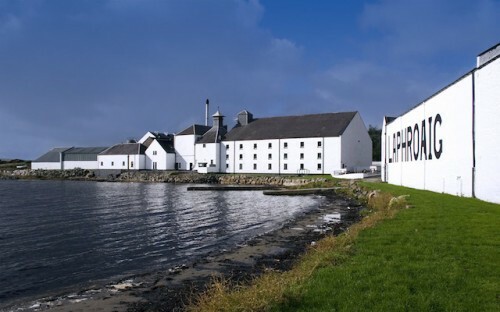 Laphroaig has their own stream and reservoir, now wholly owned by the distillery and surrounded by land parcels gifted to each Friend of Laphroaig. The water is soft and rather peaty, adding much to the flavor of the finished whisky. Next are the Islay peat beds which provide the peat used for flavoring and drying the malted barley. Islay peat is composed of primarily grass and fungal material (as opposed to wood) and this gives the whisky its peaty, medicinal qualities without providing huge smoke flavors. Finally, at Laphroaig, the largely manual process of floor malting and then peat kilning is still used. These factors as well as a number of other small nuances make Laphroaig the whisky it is. If you’re interested in the full process, I’d highly suggest watching the distillery tour video on Laphroaig’s website. It’s very well done. So, with the story told, let’s get to brass tacks. Tasting time. TL;DR – Buy the Quarter Cask and gift it (come on he’s your dad) or drink it yourself. Either way it’s a win. Flavor profile: Light sweetness at the beginning and smoke immediately as you swallow that tapers off leaving light sweetness and distinct peat flavors. As Chris put it during our tasting “It’s like gentle flute music, then WHAM! bass drum”. The finish is long, smooth and peaty. Remeniscent of sitting around a camp fire in the Pacific Northwest. Color: Straw colored. A bit darker than the regular 10 yo. Nose: Vanilla, Christmas spices, sweeter aroma than the 10 yo, peat is present but less intense. Notes of burnt orange peel and very light smoke. Flavor profile: The sweetness isn’t as forward as we found in the 10 yo but lingers a bit longer. The smoke flavors are still present, but more muted. Despite the higher proof, we found we didn’t need any ice or water to tame this whisky. The finish is medium in length and very smooth with flavors of spiced fruit cake, peat and light sweetness. Aging: Started in full size Makers Mark bourbon barrels, next into quarter casks, then finally into Spanish oloroso Sherry casks. Nose: You can definitely smell the sherry influence here. Notes of stone fruits, the smoke is similar to the level in the 10 yo (bold, but not overpowering) and the peat is downplayed a bit. Flavor profile: There is a ton going on in this whisky. The smoke and peat are back with the flavors of stone fruits and subtle sweetness. After adding a couple drops of water you get a lot more of the sherry flavors coming through to temper the peat and smoke. Don’t overdo the water though, truly just a few drops will do you. It’s interesting to note that the strength of the peat and smoke we tasted in the flavor wasn’t as readily notable in the aroma. The finish is medium with the stone fruit, peat and a touch of smoke carrying through to the end. Aging: 10 years in Makers Mark bourbon barrels. Bottled at the cask strength which varies from year to year. Nose: Surprising subtle for the strength of the whisky. Earthy and peaty with a touch of salty sea smell. Very small hint of sweet fruitiness at the front. Flavor profile: More burn (duh, cask strength) but not as much as we had expected. The peat is squarely at the forefront, but not unpleasantly strong. Surprisingly sweet throughout the flavor profile which clearly notes that this is the same whisky as the 10 yo. A touch of water is certainly warranted with this whisky given its proof. But, start slowly. You can quickly water it down too much and lose some of the complexity. Now that I’ve tasted the standard Laphroaig range (without the special stuff, sadly) my choice would definitely be the Quarter Cask if I had to choose just one. While I truly enjoyed each epression, the Quarter Cask is the one that I could see myself drink dram after dram and enjoying every last drop, every single time. Elisabeth on the other hand, loved the 10 yo best. She appreciated the sweet smokey/peaty flavors and tried to steal the bottle as soon as her glass was empty. Last note, if you (or your gift recipient) loves sherry finished scotches, you definitely can’t go wrong with the Triple Wood. *My other favorite tip from Simon – Eat dark chocolate while you’re sipping scotch. Trust me, you won’t be dissappointed. PS – I love Laphroaig scotches, and the Cask Strength especially, for making cocktails. You can add just a touch (1/4 oz is plenty) to a whiskey cocktail and give the drink a smokey/peaty depth that you can’t find anywhere else. PPS – I’m FoL member #394061 and I very much look forward to visiting my plot of land someday and enjoying the best rent you could ever ask for.